The only way to find abundant life is to give your life away.If God designed us to experience true happiness, why do so many of us feel dissatisfied and purposeless? We try to make our lives better by chasing our own ambitions and dreams, but that only makes the problem worse. Fortunately, God has made us for something better. The path to a life that is satisfying and permeated with meaning leads us into justice. Using clear evangelical theology and compelling narratives drawn from two decades of global ministry and travel, Ken Wytsma, the founder of The Justice Conference, shows God's unchanging love for all His children. Along the way, the author calls us back to a proper understanding of biblical justice, provides a redeeming glimpse of the true meaning of righteousness, and draws an indelible connection between our own joy, the joy of others, and the transforming gospel of Jesus Christ. God isn't exclusively concerned with personal piety--He wants to empower us to go into the world and do justly, love mercy, and walk humbly with our creator. The message is as hopeful as it is fresh: when you discover anew the meaning of the gospel and give your life away, you will find it ... and it will be the best life you can imagine. 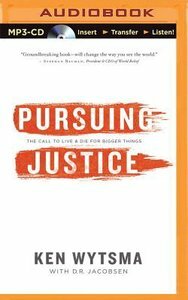 About "Pursuing Justice (Unabridged, Mp3)"